Not that long ago, I dined at Cinghiale, one of the restaurants in the Foreman Wolf restaurant group. The experience was so good that I decided I had to try the flagship restaurant of the group – The Charleston. The Charleston is also located right in Harbor East, a pebble throw away from Cinghiale. While the Charleston just may be the most expensive restaurant in Baltimore, it is definitely one of the best – if not the best. Upon walking through the frosted glass door you are greeted by the maître ‘de. You immediately notice the fusion of modern elegance with luxury. The interior is primarily shades of orange and brown with various square design patterns on the walls. The dining room chairs are grand kinglike orange suede, which are very comfortable, just like the environment of the restaurant. The menu is cleverly designed with sophisticated options that will peak the interest of any diner. There aren’t prices for a la carte items, instead you pay for the amount of courses you want, which gives you the freedom to create your own pre-fixe meal. If you want three portions of the signature lobster soup with curry you can do that. Not a bad idea either as this is one of the best things I have ever eaten. Some other menu items include cornmeal fried oysters, tuna tartar, shrimp and grits with Andouille sausage, burgundy snails, turbot with artichoke broth, rockfish and tenderloin of beef to name a few. We started with the fried oysters and the tuna tartar. The oysters were a bit mundane and I definitely expected more from a restaurant of this caliber. The oysters themselves were undoubtedly fresh but they were just merely fried and then served with an aioli – very basic. A citrus micro green salad or something to dress it up would have helped. 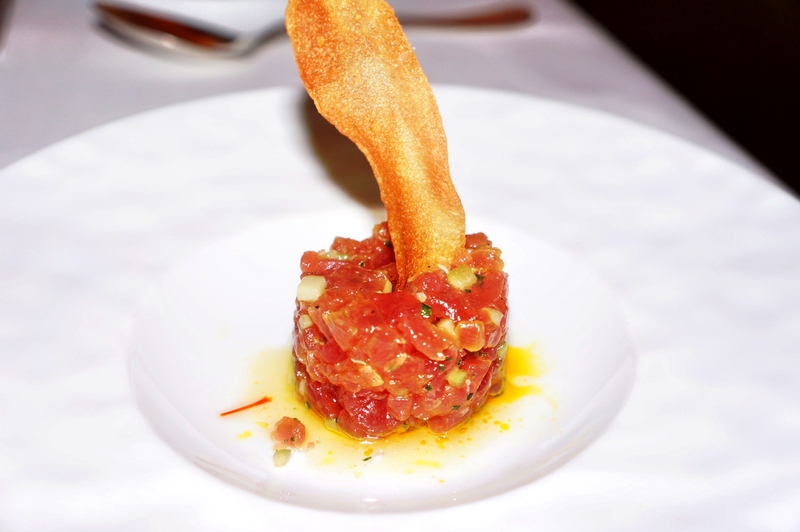 We were skeptical to order the tuna tartar because it’s so over done, but this was amazing. I truly have never tasted tuna so good. The accompaniment was basic to allow the ocean flavors of the tuna really shine. A subtle dash of earthy olive oil, scallion and cucumber was all the dish needed. 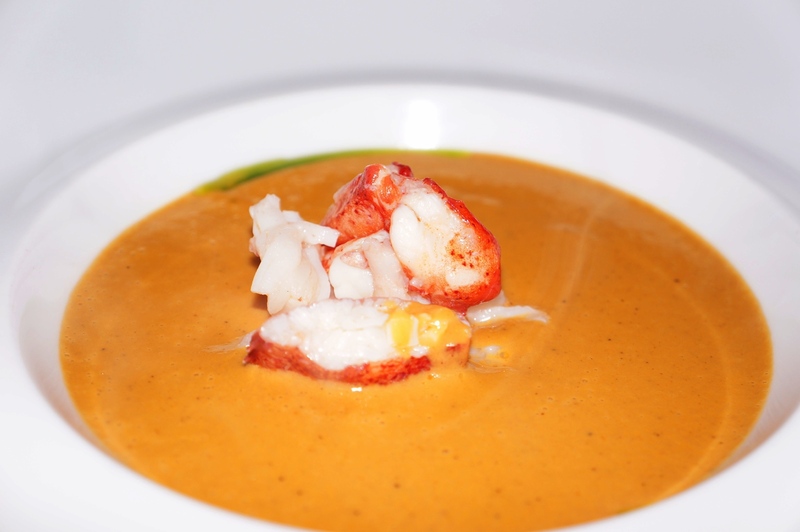 Next was the star of the entire meal – the lobster soup with curry. The bowl arrives to your table with a generous heaping of succulent lobster tail meat with arugula oil on the bottom of the bowl. The waiter then pours the soup around the lobster as you begin to take in all the aromas of the curry, sherry and cream. The velvety soft texture of the soup is something nearly impossible to achieve at home. With each bite you get the richness of the cream, sharpness of the sherry and then the perfect accent of the curry. Not to mention the lobster which was perfectly cooked and incredibly delicious on its own. To be honest, even when I was in Boston I didn’t have lobster so tasty and prepared so well. After having some time to breath after the rich soups the main courses came out. First was the pan roasted rockfish and roasted magret of duck. Both were small 3oz. portions, but very satisfying. The rockfish is served with oyster mushrooms and a lemon burre blanc sauce. 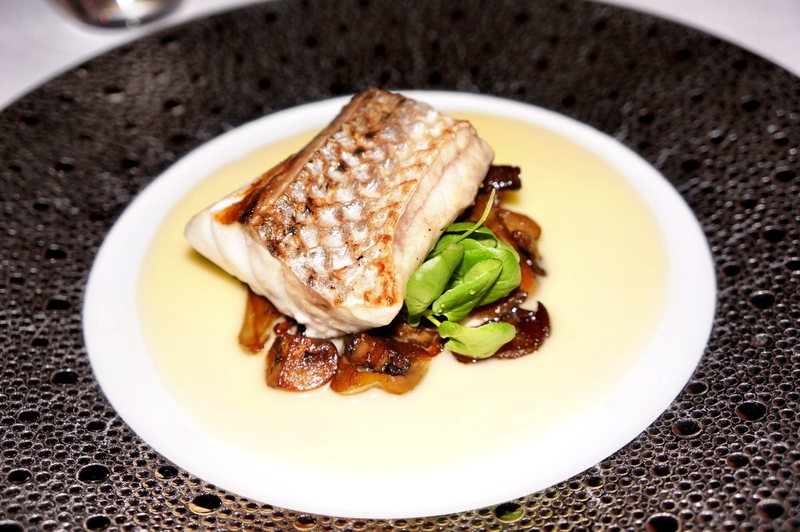 The delicate fish was very nice with the rich mushrooms and citrus wine reduction. My only complaint about this dish was that the portion of the fish was from closer to the tail of the fish so it was a bit tougher. The duck was sheer perfection however. The fat side was scored and then rendered out in the cooking process to create a very crispy exterior with a nice medium rare center. The duck was well seasoned with salt and coarse black pepper and then served with a red wine demi glace over creamy risotto. 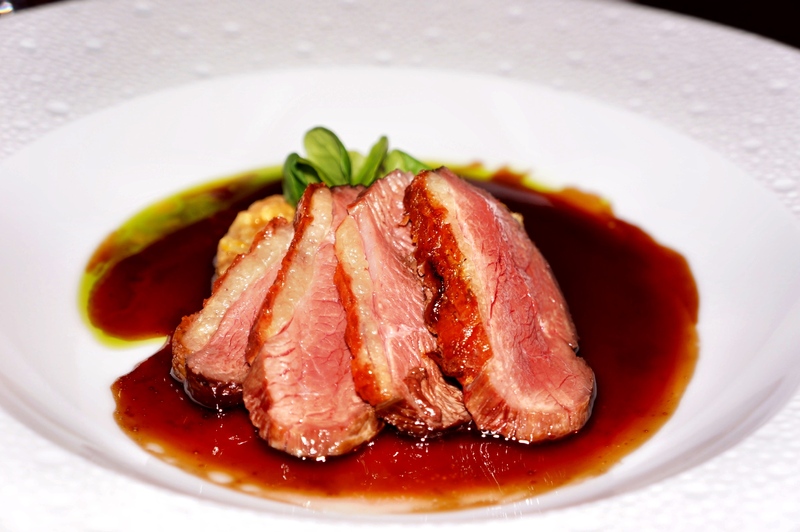 The risotto had so much depth of flavor, which was excellent with the tender meaty duck and the full-bodied sauce. We then moved to our final savory course, which were the meat selections. We settled upon the filet mignon and buffalo tenderloin. Again, both were small portions, which actually make you get surprisingly full. 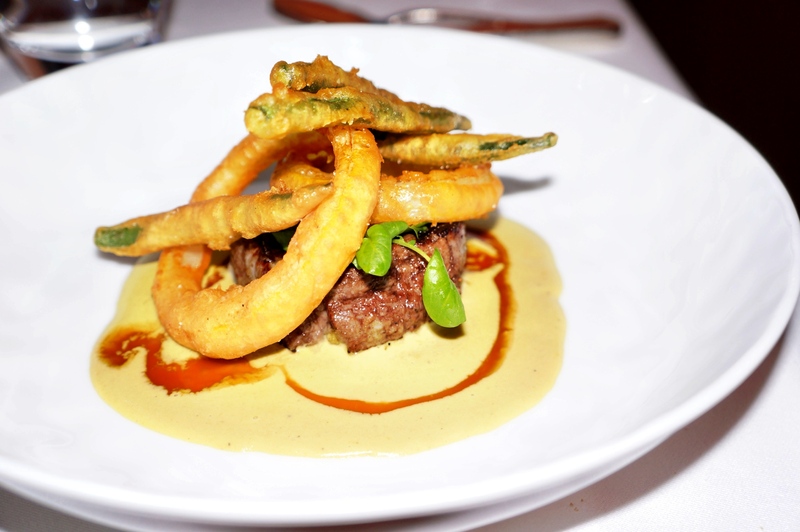 The beef was served with tempura style vegetables on top with a poblano cream sauce. The beef was expectedly tender and well seasoned, with each bite essentially melting in your mouth. The poblano sauce was an interesting spicy warmth that helped make a usually simple flavored cut of beef very delicious. The crispy vegetables on top were a complete waste and were completely out of place in the dish. We quickly moved all of them to another plate so that we could enjoy the main star – the beef. The buffalo tenderloin was even better than the beef though. The buffalo had a more pungent spice rub which was then grilled not roasted. 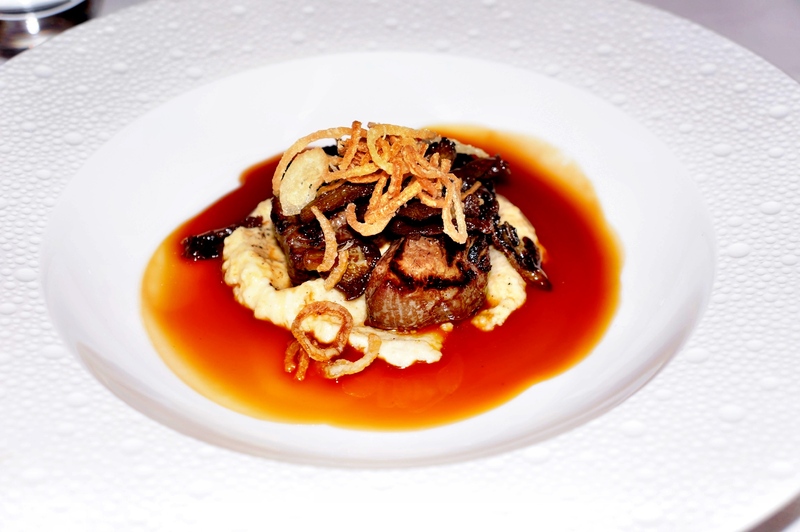 There was a slight char crust on the beef, which created a nice contrast to the soft oyster mushrooms and creamy polenta. The meat naturally had more flavor than the filet mignon with a slight gamey not, but would be appreciated by anyone who appreciates steak. Finally came the desserts, at this point we could hardly move. 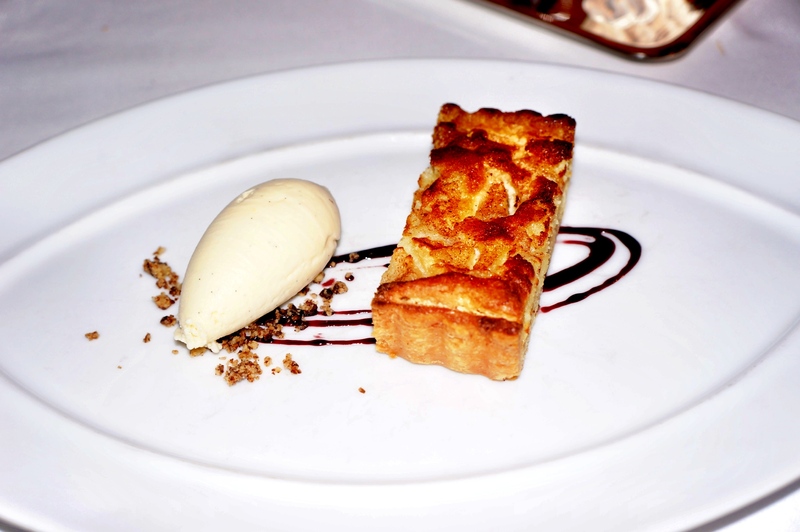 The dessert is complimentary with every meal, as our waiter said, “you just can’t leave without dessert.” Keeping with seasonal ingredients most options involved apples and pears, so it was only fitting to choose a warm pear almond tart. The tart had the usual buttery style crumbly piecrust with the softened pears and almonds on top. A raspberry reduction was drizzles underneath with granola and vanilla bean ice cream on the side. The dessert was sweet enough to satisfy a dessert craving after so many savory courses while not being over bearing. All in all, The Charleston is perfection is every sense. Every component of the restaurant and every ingredient of each dish are of the highest quality. The wait staff does an incredible job to make you feel comfortable and is very knowledgeable about the menu and wine list. Our server, Brian, was even courteous enough to offer a complimentary additional course because he could tell we really just like so many things on the menu. Additionally, you will get some other complimentary items such as amuse bouche, which that evening was a mini curried beef empanada and goat cheese crostini as well as mini dessert bites at the end of the meal. When you go to The Charleston you will definitely receive an experience that can stack up against almost any other restaurant. This is without a doubt the most complete restaurant experience and one of the best meals you will ever receive in Baltimore.